This website has the aim to introduce you to the world of fractals. A world that seems to be chaotic but when you look closer, patterns emerge. Not only are fractals theoretical mathematical constructs; the theory of fractals can be applied to fractals in nature, too. Fractals are fascinating obejcts. Coastlines, mountains, trees, ferns and many more are fractals and cannot be calculated by general geometry. Fractal Geometry has to be applied to them to understand and calculate them. But Even if one does not understand the complex mathematics behind the fractals nevertheless they are stunning. 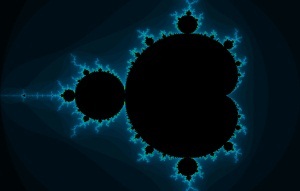 To begin the expedition to the world of fractals you should download the Fractal Explorer. This software plots some of the most important fractals and provides you with the important data. For further discovery this website contains information about the mathematical background of fractals.